Hitting fours and sixes might be the way to win in a traditional game of cricket, but when you take a spin on Microgaming's Cricket Star slot game, things are rather different. Like many of its spinning peers, this online video slot machine offers a heady mix of win symbols, jackpots, bonuses and free spins. Of course, if you want to turn runs into prizes, you need to know a few basics. Fortunately, we're here to help with our Cricket Star slot review. In this Cricket Star guide we'll show you how to play and, more importantly, how you can win some serious cash when you start batting for glory! Play Cricket Star for Real Money! The Microgaming creation falls in the sports slot game type. Following a similar format to Football Star, Basketball Star, Rugby Star and other sporty slots, Cricket Star features action shots, symbols that burst into a firework display and, as you'd expect, the roar of the crowd as you spin. In fact what the software provider has attempted to do with this video slot is make it feel as though you're at an international cricket match. Of course, if you're not really a fan of cricket then you might be a bit lost when it comes to the actual aim of the game. However, that doesn't really matter when you're playing Cricket Star because you'll always have the option of clicking on the game guide and rules to find out what a symbol means. 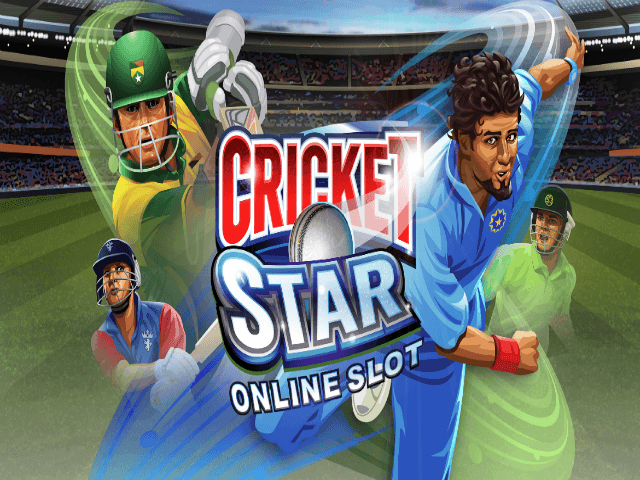 Overall, if you're looking for an online slot that's packed with colour, sights and sounds, Cricket Star is a real winner. When it comes to mechanics and game design, Cricket Star doesn't offer set paylines or a certain number of ways to win. Instead, when you set the five reels in motion, you'll be given 243 ways to win. In line with this dynamic, players will be able to set your coin size from 0.01 to 0.10 and then bet between one and ten coins per spin. 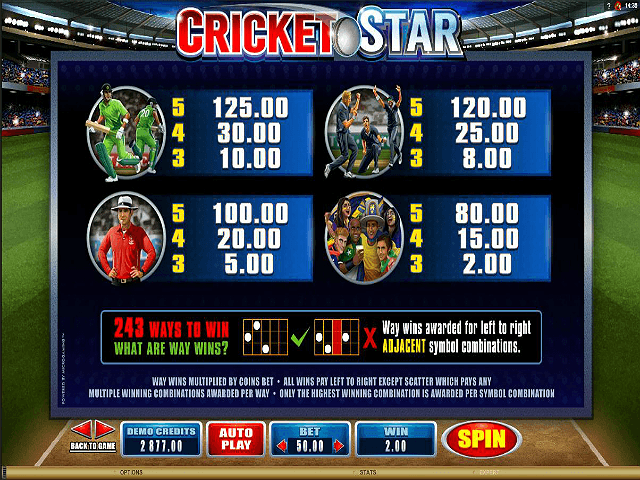 After you've set the reels in motion, the Cricket Star payout table is a mixture of low wins and jackpot prizes. At the lower end of the spectrum, three catchers will earn you a prize worth 0.75x your bet while the jackpot combination (five Aussie batsmen) is worth 250x your stake. 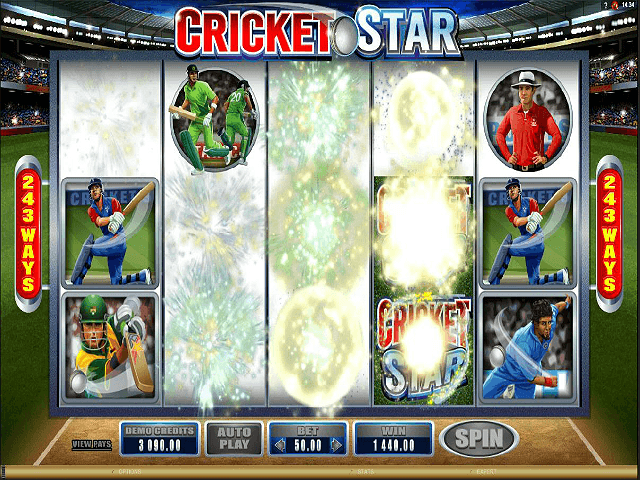 Up until this point, the flow of action inside the Cricket Star online slot game has been fairly standard. You set your bets, the five reels turn and you play for a top prize of 250x your stake. However, what would a modern online slot machine be without a few extras? The answer is not very good, which is why the developers at Microgaming weren't going to be caught out by not including some special features. The first unique feature you'll find when you play Cricket Star is that it offers a rolling reels function. As we noted earlier, when you spin in a win, the symbols literally explode like a firework display. After they've done this, they disappear and get replaced by a new set of symbols. In other online slot games, this is known as a cascading win feature and basically allows you to set in motion a chain reaction of wins. As symbols disappear and new ones appear, players have the ability to bank additional wins without spinning the reels! 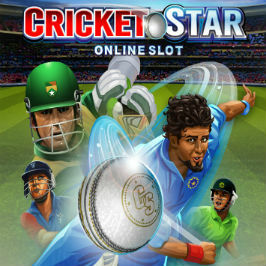 On top of this special feature, Cricket Star Online Slot also offers a bonus round known as Wild Wicket. When three wickets randomly appear over the top of reels 2, 3, and 4, a ball will knock one down and turn that reel completely wild, guaranteeing you a win for the player. 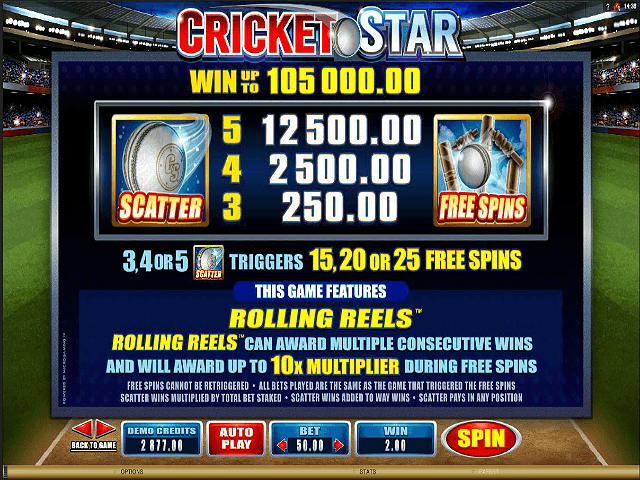 If all that wasn't enough, the Cricket Star scatter is on hand to give you some free spins. Three or more cricket balls in view will trigger up to 25 free spins that can combine with the rolling reel feature to give you a multiplier worth up to 10 times in the original stake. All in all, when you combine these free spins with Cricket Star's bonuses and win features, you get an online slot game that's as lucrative as it is entertaining! Share this Cricket Star Review today! If you like Cricket Star, you'll love these slot titles too!